Explanation: This night was a sky enthusiast's delight. While relaxing in Sweden last week, many a cosmic wonder was captured with a single snapshot. They are described here from near to far. In the foreground are nearby trees and more distant snow covered mountains. 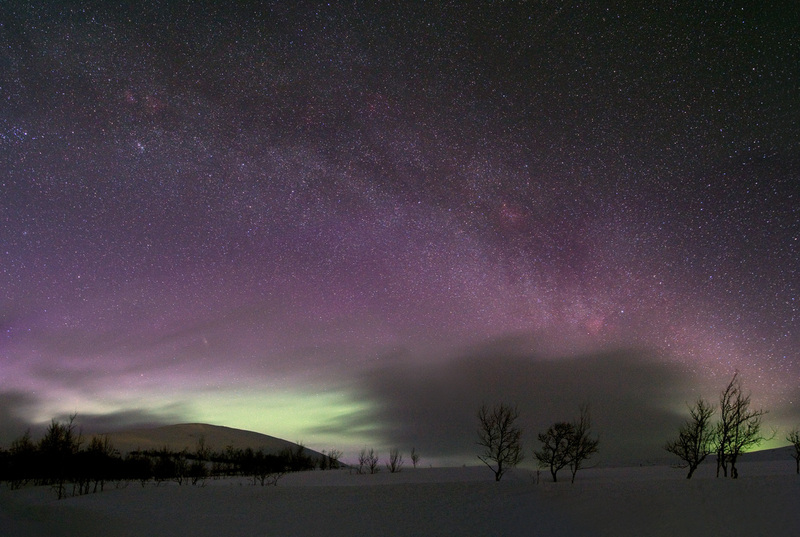 In silhouette, Clouds can be seen just above the horizon, and a careful eye can even discern the more distant green and red auroras which occur in Earth's upper atmosphere. Red emission nebulas dot the sky, including the Heart and Soul Nebulas, IC 1396 and the North America Nebula. Running diagonally from the upper left to the lower right is the majestic glowing band of our Milky Way Galaxy's central plane.. More distant than everything else, appearing as it did over two million years ago, is the Andromeda galaxy, visible above the horizon toward on the lower left.